Kathmandu Forestry Collage (KAFCOL), Ithaka Institute for Climate Farming Nepal and Ministry of Forest and Soil Conservation, Nepal jointly applies this collaborative activity proposal to IPSI Secretariat for approval. 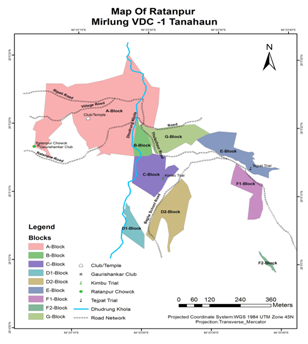 This project is proposed to be implemented in Ratanpur villages of Tanahun District (middle hill region) of Nepal with a population of more than 1000 and 224 households. Ethnicity consists of mainly indigenous and disadvantaged communities. This project assists mostly low-income woman farmers to establish sustainable agroforestry forest fruit garden system on barren and under-utilized private farm lands by planting high value timber, fruit, nut, fodder and oil as well as non-timber forest products species including ginger, turmeric, black piper, mulberry, Moringa oleofera (drum stick), Buddha chitta mala, Shiva tree, cinnamon tree and broom grass. These species were locally grown in the past two-three decades in the proposed region, but have since almost disappeared from these lands. Agro-forests and cottage industries on family owned farms will be established with the aim to produce both food and fodder for own use and cash incomes from the processing, development and sale of organic non-timber tree products for example Organic Cinnamon leaf oil for the tea and cosmetic industry, and dried Moringa leaf for ‘super food’ producers. In the beginning, existing old local trees will be used for processing essential oil. Innovative knowledge from biochar based organic farming and biodiversity research will be applied to improve fertility and climate change resilience on depleted and abandoned hill-side soils. Those methods proved already to increase the survivability rate and productivity of the planted trees and crops. On farm investments are needed for water harvesting swales and small dams to provide irrigation in dry periods. The increasing carbon stocks both in tree biomass and soil carbon will be sold under a “fair trade carbon farming” offset to CO2 emitting organizations in Europe. The main objective of the project is to help breaking the negative cycle of land degradation and diminishing returns from the practice of low-input monocultural farming on depleted hill-side soils and thereby improving livelihoods for their families and village communities and restoring disappeared trees and plant species of private owned barren farm lands. Create opportunities for new jobs in the village and thereby motivate migrant youths returned home. Site design, on farm improvements, soil preparation and intercropping of legume trees and shrubs in the agroforestry system. Producing essential oil from tree leaves, sourcing leaf drying and crushing equipment for Moringa leaf production and packaging, collaboration with organic certification bodies to implement certified organic practices on farm. Marketing of organic products to major suppliers such as Lush (soap) and Yogi Tea, by the project . Promotion of “fair trade” carbon offsets to environmentally friendly businesses and individuals in Europe and carbon payment. Planting of at least 16,000 trees and NTFPs species on 20 ha private farm lands of at least 150 farmer families and sequestration of at least 150 t CO2eq per year. Annual amendment of 75 t of biochar to the soil, to sequester around 200 t CO2eq annually. At least 50 additional Agroforestry plant species including timber and non-timber species restored and preserved. Installation of one innovative oil distillation unit powered by bioenergy and which produce biochar and stored hot water. Production of high value non-timber tree products e.g organic Cinnamon leaf oil and dried moringa leaf for export to international vendors. On farm investments in water harvesting swales and dams, and biochar and organic fertilizer production to make farms self-reliant for crucial nutrient and water supply. Establishment of a voluntary “fair trade carbon offset” program that makes possible long term financing from richer countries for agroforestry land improvements in Nepal. These activities will mainly be implemented by the Kathmandu Forestry College (KAFCOL) in collaboration with the Ministry of Forest and Soil Conservation (MoFSC)/ District Forest Office, Tanahun and Ithaka Institute for Climate Strategies Nepal. District Forest Office, Department of Forest under MOFSC, Nepal (IPSI Steering Committee member) will provide a necessary role to implement private forest rules and regulation in support of local communities including tree saplings arrangement for forest gardening. The Ithaka Institute is a volunteer climate farming private organization will be used in advancing forest garden design for increased carbon capture, designing and implementing key product value adding technologies eg. biochar / essential oil production equipment and communicating and marketing of fair trade carbon credit program in Europe and US. Besides the other local forest user groups and women associations will be involved in participatory management of forest gardens. This project falls within three IPSI strategic objectives including 1-increase knowledge and understanding of SEPL, 2- reduce direct loss of biodiversity and 3- enhance benefits from SEPLs. People will gain knowledge and wisdom on how to secure ecosystem services and value through various training on water harvesting swales and dams, and biochar and organic fertilizer production to make farms self-reliant for crucial nutrient and water supply and ecosystem services under objective 1. Under objective 2, the agroforestry plantation will reduce the direct pressures on BD and promote sustainable use and management of areas under agriculture and forestry, and manage and use invasive alien species for making biochar based organic fertilizer. Restoration of previously lost or disappeared agroforestry tree species will safeguard the ecosystems, which ultimately provide essential services; ecosystem resilience and contribution to carbon stock (objective 3). Joint monitoring will be done by Kathmandu Forestry College and Ithaka Institute Nepal in a quarterly basis. The annual report will be submitted by KAFCOL to IPSI secretariat.